Savon et gel douche naturel, soin naturel corps, soin des mains Nature et Senteurs : savon naturel, crème mains, lait pour le corps pour laver, protéger, hydrater, réparer, nourrir tout type de peau. Natural body and hand skincare: natural shower soaps, body milks and hand lotions! Nature et Senteurs is a collection of Provence scented natural soaps and skincare products to clean, protect, moisturize, repare and nourish every type of skin. 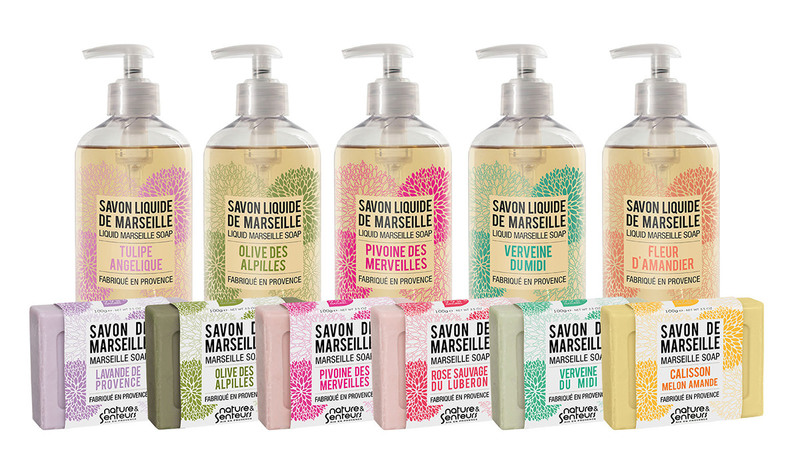 Nature et Senteurs shower, body and hand skincare: natural and biodegradable formulas with wonderful Provence scents! Are you looking for natural and healthy products to have a peaceful shower, to moisturize and protect your body and your hands, to repare and nourish your skin? Don’t look for it anymore! Natures et Senteurs, a brand from Horizane Santé Laboratory, has developed shower gels and natural skincare products to clean and daily take care of your body. Out of the best beauty technologies, Nature et Senteurs shower gels, soaps, body milks and hand creams are natural and unique skincare. Their formulas are based on 100% vegetable oil complexes that take great care of your skin: olive oil, aloe vera, shea butter and almond oil. Healthy body skincare combining efficiency and pleasure, they also respect nature. Provence is in the air! You will always find what you need thanks to the great selection of products and sizes adapting everyone’s lifestyle. Please go through “Natural shower and body skincare: advice from Horizane” for your skin to enjoy all the benefits of nature! Nature et Senteurs natural body and hand skincare: Provence scented natural and “high tech” formulas. Formulas of our natural skincare products are based on 100% vegetable oil complexes such as olive oil, aloe vera, shea butter and almond oil which are known and renowed for their tremendous dermatologic benefits. Nature et Senteurs offers you an ultra-natural cosmetic combining efficiency and pleasure: it is made with 100% vegetable oil complexes and inspired by Provence scents. The efficiency of our natural shower and body skincare products has been clinically tested and proved for your safety and health. It doesn’t matter whether it is the natural shower gel, the solid soap, the moisturizing body milk or the nourishing and protective hand cream: all of our products are very healthy for your body. All “suspect” ingredients such as paraben, phthalates, phenoxyethanol, colorants, sulfate, methylisothiazolinone, etc.., are banned from our formulas. For all our shower gels and body and hand skincare products: production process respecting the environment and biodegradable formulas. Our production processes are selected according to the respect of the environment and our production formulas according to their complete biodegradability. Our soaps are authentic Marseille soaps manufactured according to the ancient process of saponification, without any toxic pollution for the planet. Natures et Senteurs feels totally concerned by the protection of the planet: we deliberately and steadily make the choice of biodegradable and ecologic products i.e. “eco-friendly” products to preserve the environment. Either gel, solid, economic bottle or mini-format natural products: make up your choice! Shower gels, soaps, creams: Nature et Senteurs skincare products are offered in many different forms, sizes and fragrances to answer all your desires and fit different lifestyles. Our body skincare products are offered either in gel or solid form, in economic or mini formats, which is more convenient when travelling. Because Nature et Senteurs also feels concerned by making your life and beauty routine easier! Open your shower gel, unwrap your solid soap, crack open your cream and there it is: scents of Provence are right here with you! Nature et Senteurs body and bath collection comes from an authentic know-how: all our products are exclusively made in Provence. The collection offers a great choice of fragrances praising the vast fields of Provence. Do you want a bit of Provence for yourself or do you feel like offering some to relatives? Do you want to indulge yourself or others? Natures et Senteurs natural products are available in giftboxes! 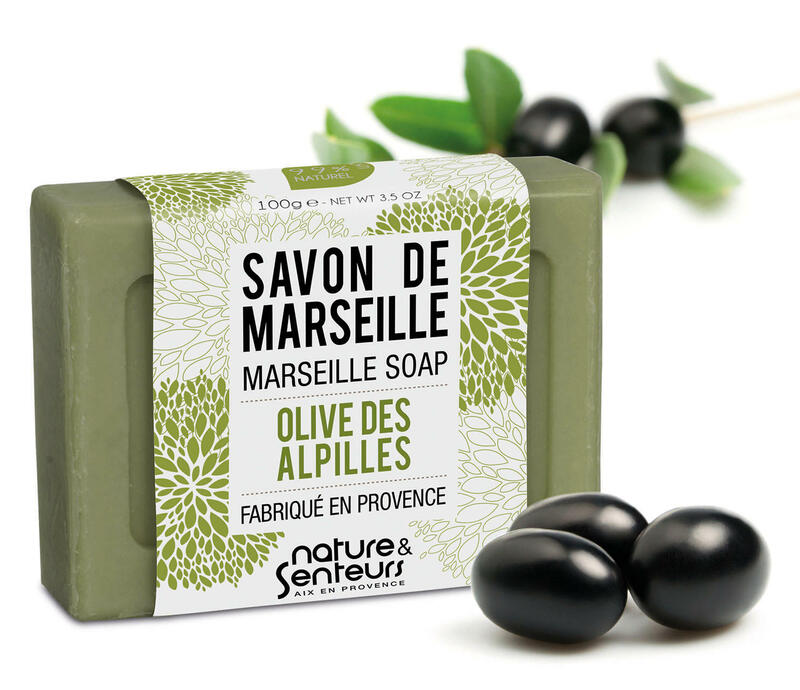 Let’s focus on the traditional production process of Nature et Senteurs Marseille solid soap. • It is made in Provence according to a traditional know-how. • It contains 72% of vegetable oil, including olive oil. • Its surfactants are natural. • O% of animal fat, without paraben, phthalate or synthetic components. • Environmental-friendly and 100% biodegradable. How is Marseille soap produced? The code requires the respect of a production process including saponification. • THE RELEASE: caustic soda and leftovers are removed from the paste with salt water. The paste is then left to rest. • FILLING THE POOL AND DRYING: the paste is poured in a pool.